Over the past two decades, Mary Lou and Buonaveta Fernetti, the owners of the Art Needle Workshop, have been very busy people. Since the re-construction of the Mormon temple, Nauvoo has gone from ghost town to boom town, which has made the Fernetti's little shop just a half block from the temple a popular place to be for those visiting the area. Tourists not only stop by the Art Needle Workshop to purchase items that will forever commemorate their journey to the historic site such as t-shirts and replicas of the temple, but to also pick up sewing and crocheting supplies, as well as hard to find antiques in the back room. With the calendar changing from April to May, the Fernetti's have begun preparation for the upcoming tourist season, although Mary Lou anticipates a little less traffic through the store this year in the wake of high gas prices. Nonetheless, people will be traveling from all over the globe this summer to experience the sites and sounds of Nauvoo and learn about this historic community, as it is one of the most sacred locales within the LDS church. Nauvoo not only hosts the grand Mormon temple that overlooks the mighty Mississippi River, but an interactive blast from the past on the flats that allows visitors to experience what it was like during the pioneer days, which also serves as the final resting place of the original founder of the Mormon church, Joseph Smith. As people come in to the shop throughout the summer months, they find this store isn't exclusively accessible in Nauvoo alone, but anytime throughout the year while they are back at home they can virtually navigate through the store and purchase items in their online store and take advantage of deals that are exclusive to shopping online. People from all over the United States and abroad take advantage of this convenience, keeping their business fruitful even in the winter months when less people will be scurrying about Mulholland Street and the rest of Nauvoo. 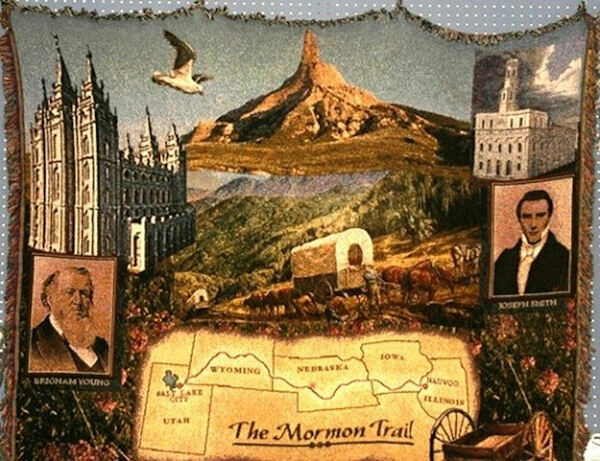 Make sure to stop by their location just across the street from the Hotel Nauvoo and uncover a hidden treasure you've been looking for, or visit them just a click away at www.artneedlework.com. An example of oneÊofÊthe Art Needle Workshop's many fine quilts and throws.